Autumn is rolling across North America, and capital is continuing to roll into commercial real estate locally, regionally and globally. However, investors are looking outside their traditional comfort and target zones due to limited supply in many areas and compressing cap rates. 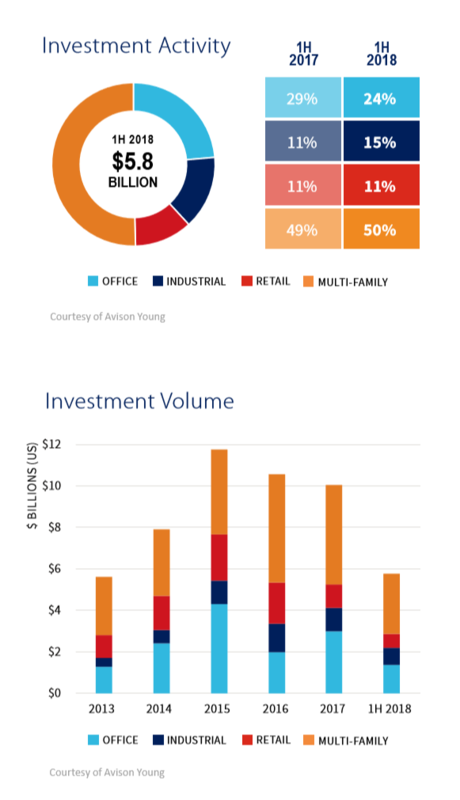 In its “Fall 2018 North America and Europe Commercial Real Estate Investment Review,” released this week, Avison Young covered CRE investment trends in 59 markets in the U.S., Canada and Western Europe. The report notes CRE investment across borders in North America, particularly from Canada to U.S., remains strong, and that Mexico is, “one of the most open economies for international trade and investment.” These are both attractive situations for Arizona, given the ongoing appetite of Canadian investors in this market and the state’s strong trade ties with Mexico. Canadian investment remains the leading foreign source in U.S. markets, but Chinese investment has dipped. Chinese investors spent $17B in 2017, but at mid-2018 they totaled only $4.9B. Fueled by development across the county, multifamily investment was 35 percent of the national total at $48B, up 12 percent compared to the first half 2017. Office investment dropped 9 percent to $45.6B as asset values dipped Y-o-Y and investors continue to show a preference for newly-built, high-quality offerings. Industrial, at $23.6B for the first half, posted a 19 percent Y-o-Y increase, largely due to the surge in ecommerce distribution centers. Average cap rates across all sectors were down slightly to 6.4 percent. The 7 percent rate for office was highest, and the 5.6 percent rate for multifamily was lowest. Institutional investment in Phoenix was higher in the first half of 2018 than in the first half of 2017, fueled by the markets demographic growth and strong economy. Across all property types, volume increased 33 percent. Industrial saw the highest percentage growth at 73 percent, but multifamily accounted for half of the total volume in the local market. Except for retail, cap rates contracted for all property types. Four of the five largest first half transactions were in multifamily. Per-unit pricing was between $143K and $346K, with average unit pricing increasing 4.9 percent compared to first half of last year. There were 19,000 units under construction at the conclusion of 2017’s second quarter. At the end of second quarter 2018 there were more than 20,000. The full Avison Young report is available here.